Yuuichirou Hyakuya is a member of Japanese Imperial Demon Army's Demon Moon Squad and the main protagonist of the Owari no Seraph series. He was abandoned by his parents since he was a child and he ended up at Hyakuya Orphanage. Since then, the kids of this orphanage were his only family. A bit after while he was still a child, the vampires took him and the rest of the orphanage to their city to become "livestock." After Michaela gets possession of a map of the underground, both of them decide to escape the place with the rest of the children of the orphanage. However it is revealed that is was all a plan of Felid Bathory, one the Seven Founder, and the attempt to escape is frustrated leading to death of all the family except for him. After getting to the outside world he is found by Guren Ichinose, a captain of the Japanese Imperial Demon Army. In order to take revenge for his family, he decides to join the Japanese Imperial Demon Army to gain the power he needs. 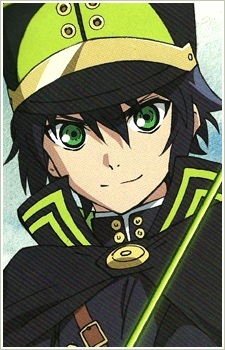 Yuuichirou possesses the "Seraph" gene, which is relevant to the forbidden taboo and the focal point of the story, "Seraph of the End". Yuuichirou's father pulled a knife out on him and attempted to take his life unsuccessfully. His mother committed suicide, lighting herself on fire while screaming at Yuu to join her. His parents sold him to one of the largest magical syndicates in Japan before the Catastrophe, the Brotherhood of a Thousand Nights. They were the ones who performed all the experiments on Yuu when he was a child and still in Hyakuya Orphanage. His brain had been erased of it's memories more than 7 times while he was only seven years old.